Some 52,000 community water systems and 21,400 not-for-profit non-community water systems across the US will require approximately $384.2 billion of infrastructure investment through 2030 in order to assure the provision of safe drinking water to 297 million Americans, according to the Environmental Protection Agency’s (EPA) “Drinking Water Infrastructure Needs Survey and Assessment: Fifth Report to Congress” (DWINSA). “A safe and adequate supply of drinking water in our homes, schools and businesses is essential to the health and prosperity of every American,” EPA Acting Administrator Bob Perciasepe was quoted in a press release. Conducted every four years since a 1996 amendment to the Safe Drinking Water Act (SDWA) , the EPA’s fifth DWINSA is its most comprehensive effort yet to assess and document the critical public water infrastructure investment needs of the nation’s public water systems over 20-year time horizons. Nearly $15 billion in DWSRF grants to all 50 states and Puerto Rico have been made since the program’s inception in 1997 to improve drinking water treatment, transmission and distribution. In addition, more than $5.5 billion in DWSRF funds have been provided to protect drinking water in disadvantaged communities. 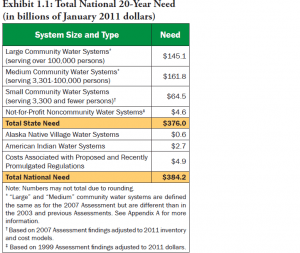 Developed in consultation with all 50 states and the Navajo Nation, the fifth DWINSA assessed funding and operational needs of more than 3,000 public drinking water systems across the nation, including those in tribal communities. 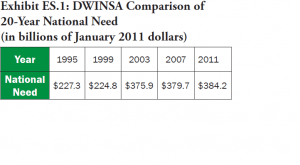 A relatively small percentage (10.9%) of the total national need of $384.2 billion are associated directly with complying with SDWA regulations. Looking to bridge a gap and address the safe drinking water needs of those not eligible for DWSRF grants, the EPA in 2012 awarded nearly $15 million to provide training and technical assistance to small drinking and wastewater systems – those serving fewer than 10,000 people – and to private well owners to improve small system operations and water utilities to strengthen the resiliency of drinking water systems against the potential impacts of severe weather events and climate change,” according to the EPA’s press release.